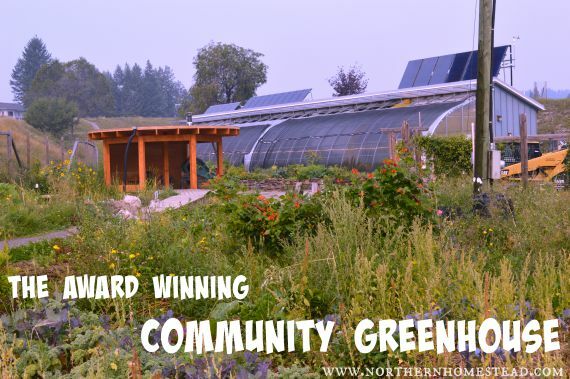 We had the privilege to visit the award-winning, passive solar community greenhouse and permaculture gardens from Groundswell Network Society in Invermere, BC. We had heard about this greenhouse and seen videos about it and were eager to see it in real life. We booked a tour and enjoyed a day in this beautiful part of the country. You can find more info and even book a tour for yourself at Groundswell Network. Their own Groundswell Network website offers information about the technical side of the greenhouse, the side Jakob was very interested in ;). Go over and read more there. I wanted to share with you some things that I thought were really working well and maybe we, and our readers could do at home as well. The community greenhouse has a concrete floor. 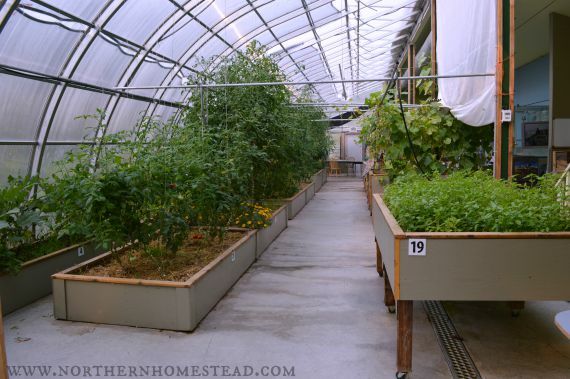 As you might know, our garage greenhouse has a concrete floor as well, so the grow beds were of special interest to us. We could easily see that their beds worked very well. The beds are about 4 by 6 feet in size, some on the ground and some on legs and even on wheels to be easily moved. All the boxes are made out of wood around and metal netting underneath. 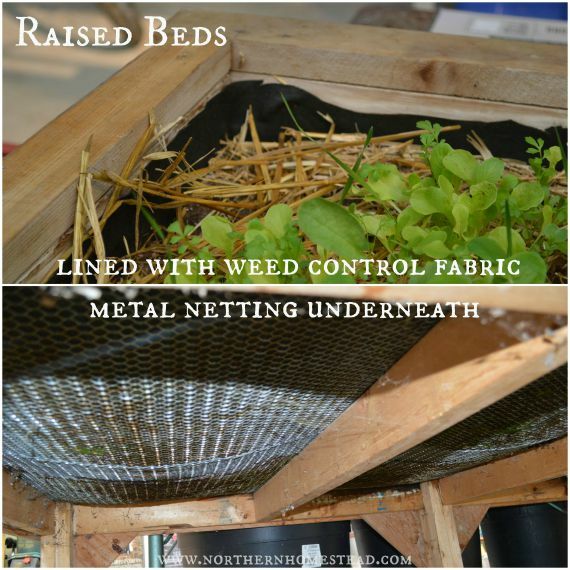 The box is lined with weed control fabric, making a well-drained grow bed. We were told that the grow beds have some gravel on the bottom for drainage and they are filled up with good potting soil and lots of worm-composting. It was also interesting to hear from someone who has wicking beds that these beds in the Invermere greenhouse are better. Outside, along with the greenhouse in the permaculture gardens, were raised garden beds as well, the best garden beds I have seen for cold climates so far. The south side of the garden beds is fully laid out with rocks, making a thermal wall for the whole bed. On the north side are keyhole raised beds. A space saving and very effective solution. Als,o the wood is lined with plastic that will protect the wood from rotting. Raised beds are definitely a great way to build soil only where needed. 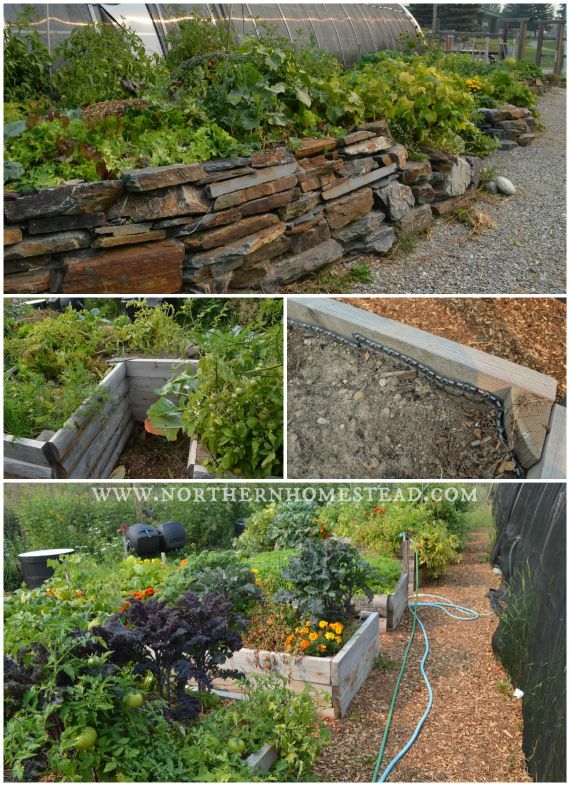 Plus, raised beds are great in northern climates. 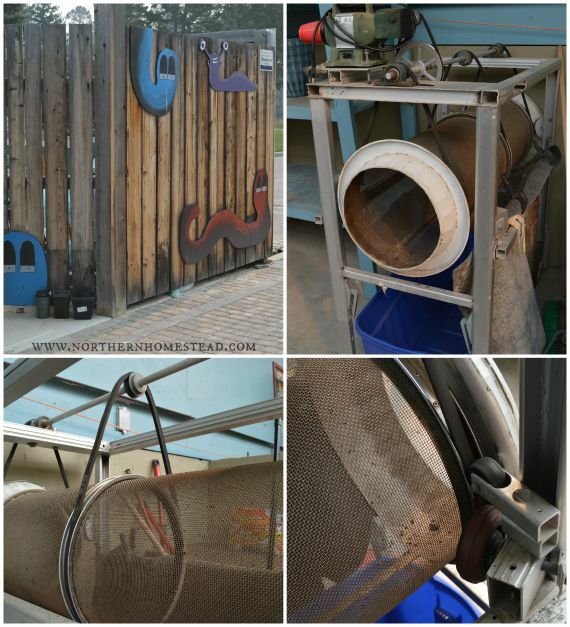 The design is beautiful and very efficient. Loved it! Invermere, BC is not a place that can boast with good natural soil. All the growing soil here has to be built through composting and mulching. 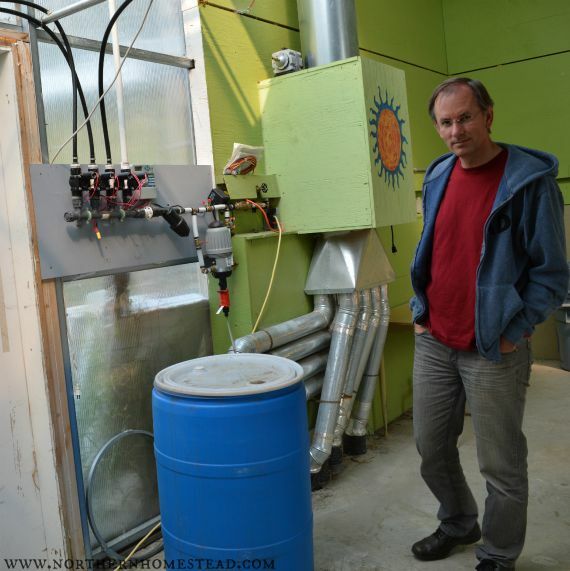 It was impressive to see the soil building worm compost they have, and also encouraging – it works. The compost is sifted, making a light growing medium for the beds. Invermere, BC has a rather dry and hot summer resulting in watering needs for plants indoors in the greenhouse and outdoors in the garden. 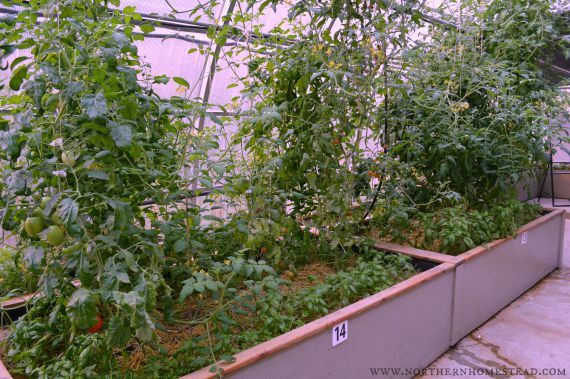 The greenhouse has an rainwater gathering system in place and all the raised beds had an automatic drip system. For raised bed,s a drip system is a great way to water. 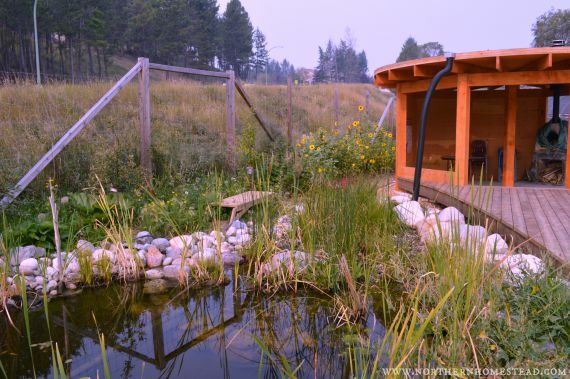 In the permaculture garden, there is a natural pond as a center piece of the garden. All around the garden has swells, resulting in even water distribution whenever it rains. Again, the design is beautiful and effective. The whole site is still very young, but things are growing and good soil is building up. A big Thank You to Groundswell Network Society community greenhouse and permaculture garden for a great tour. 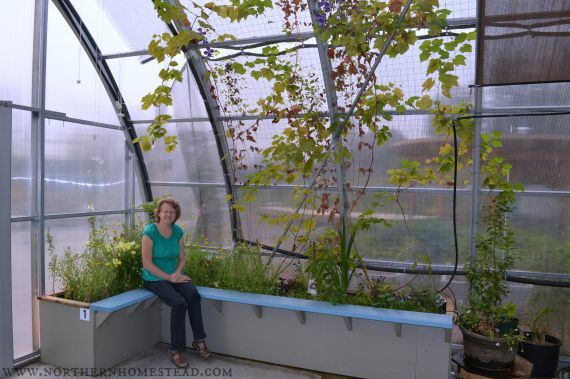 You might also enjoy an indoor window garden as an alternative to a passive solar greenhouse. So interesting, gleaned a lot of great tips from this article. Thank you for sharing. Your welcome Sarah, we were so glad to be able to do this tour, it is nice to learn from experts. Wow…this is really great! Thanks for letting us join you on your tour! Thanks for linking up with Green Thumb Thursday. I hope to see you back this week. It was fun, glad you enjoyed it too.